Basket Raffle Tickets on Sale at tonight’s MIOSM Concert at BJH! 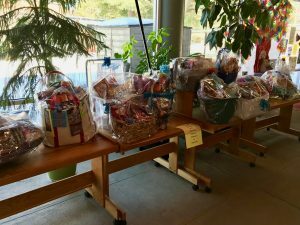 Our fundraiser baskets will be on display at tonight’s “Music in Our Schools” Month Celebration Concert AND raffle tickets will be on sale!! ($1 each/6 for $5). Come check them out and enjoy performances by the BJH Advanced Choir, Wind Ensemble, Jazz Choir and Jazz Band! Doors open at 6:30 PM, the concert begins at 7:00 PM. Can’t make it tonight? You can also check out the baskets and buy raffle tickets at the Sixth Grade Band and Chorus Concert on 3/27 and the 7th & 8th Grade Chorus Concert on April 3! Tickets are also available in the Main Office at the Jr. High or from Mrs. Tarleton and Miss Anderson. Raffle winners will be drawn on April 4. We will notify winners and you’ll be able to pick up your basket at the Jr. High!